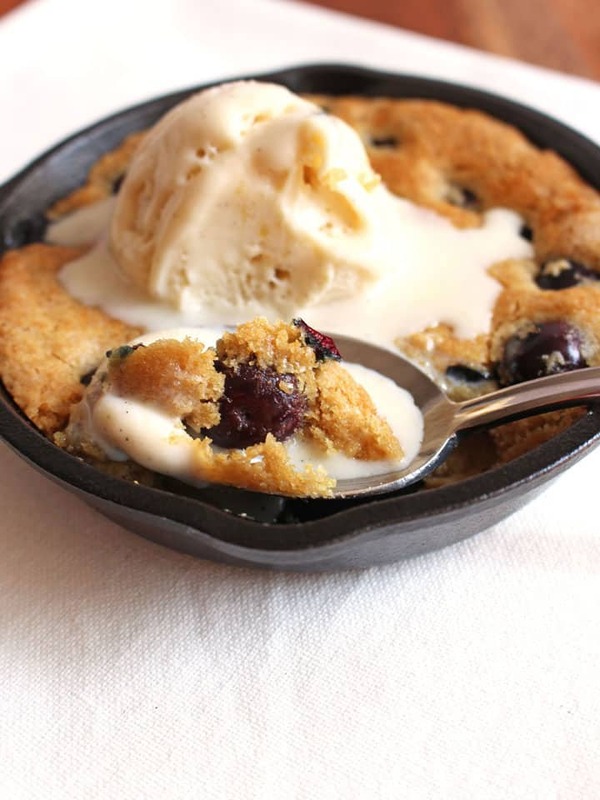 Blueberry Lemon Skillet Cookie for Two. 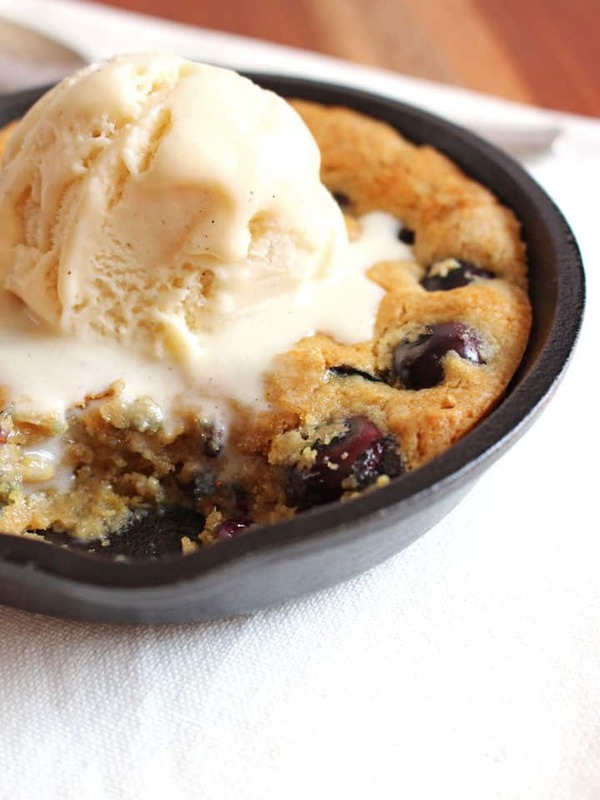 A chewy tart honey lemon mini skillet cookie filled with juicy fresh berries and topped with a scoop of vanilla ice cream. 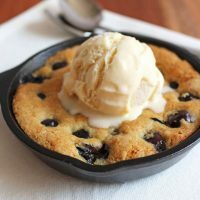 This skillet cookie recipe will fill your kitchen with a bright lemon scent and it tastes unbelievably delicious. 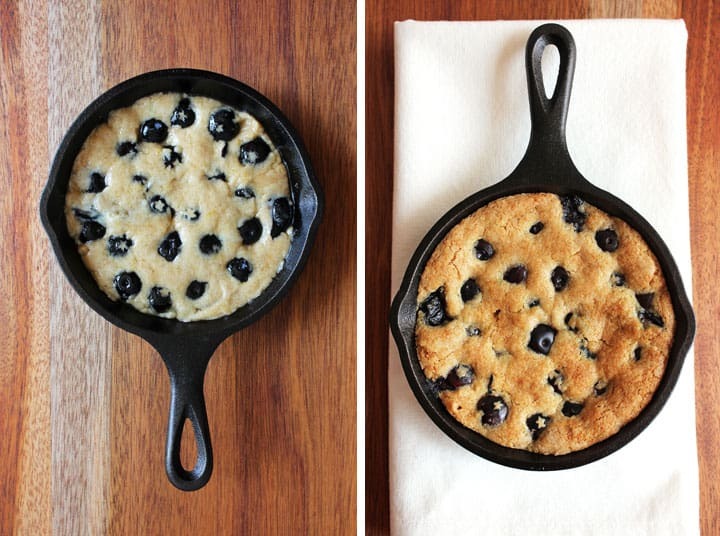 I actually can’t oversell this adorable Blueberry Lemon Skillet Cookie for Two. A decadent toaster oven dessert that’s super simple to throw together. Just 10 ingredients, one bowl and less than 15 minutes to make! The mini cast-iron skillet creates a golden crispy crust and a chewy cookie center. If you don’t have a mini skillet a ramekin can be substituted but your cookie crust won’t get as golden and you’ll need to increase the bake time a little (see recipe notes for bake times). Each crispy, chewy, yummy spoonful is full of fresh blueberries just waiting to explode in your mouth bursting with summertime berry flavor. For more summer berry-filled treats try our Easy Flatbread Fruit Pizza, Berry Flag Toast or Potsticker Fruit Tacos. 6-18-2016 Update to Original Recipe: We’ve made this cookie skillet a bunch in the last year with different types of flours and have come to the conclusion that whole wheat pastry flour tastes the best and results in a perfect golden cookie top as pictured in the post. You can find whole wheat pastry flour in the bulk bins at most large grocery stores. If you don’t have any available you can substitute white whole wheat flour or regular whole wheat flour but reduce the amount of flour used to only 1/4 cup. We have not tested this recipe using all-purpose flour, if you do please leave a comment with your results! A 10 ingredient - 1 bowl recipe that comes together quickly, fills your kitchen with a bright lemon scent and tastes unbelievably delicious. In a small bowl combine melted coconut oil, honey, vanilla extract, grated lemon peel and lemon juice, whisk until well combined. Stir in whole wheat pastry flour, baking powder, baking soda and salt just until combined. Fold in blueberries. Pour batter into a 5 inch cast-iron skillet and smooth batter into an even layer. Bake at 350 F for 8 to 10 minutes until top of cookie is golden brown and set in the center. Let cool for at least 5 minutes before eating. Serve warm and top with a scoop of ice cream. Measure coconut oil before honey. The residual coconut oil will coat the tablespoon keeping the honey from sticking. You can substitute a scant 1/4 cup of whole wheat flour or white whole wheat flour for the pastry flour. The cookie will have less of a light crispy texture on top but still tastes pretty delicious. If your blueberries are very small reduce amount to 1/4 cup. 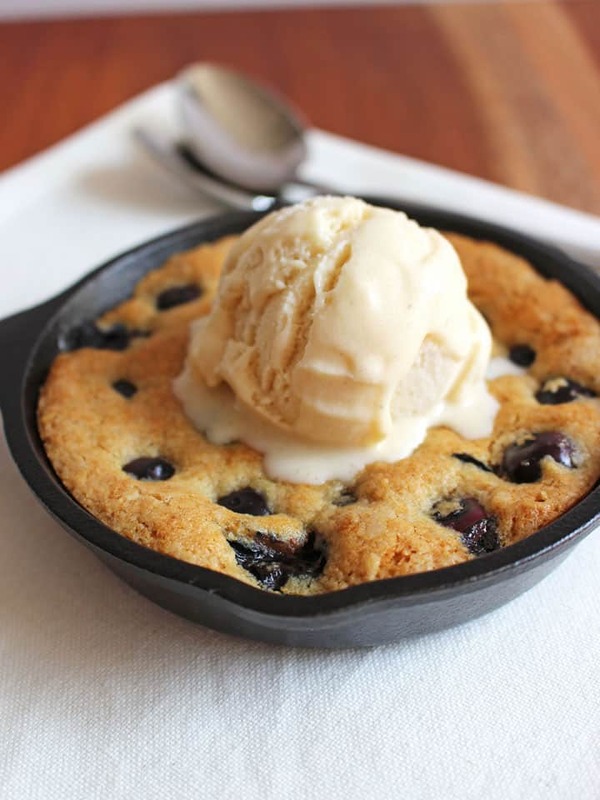 Nutritional information is an estimate for 1/2 of a skillet cookie made with whole wheat pastry flour and topped with a scoop of slow-churned vanilla ice cream. Nommm…. A warm and chewy giant cookie would make such a perfect dessert for date night! 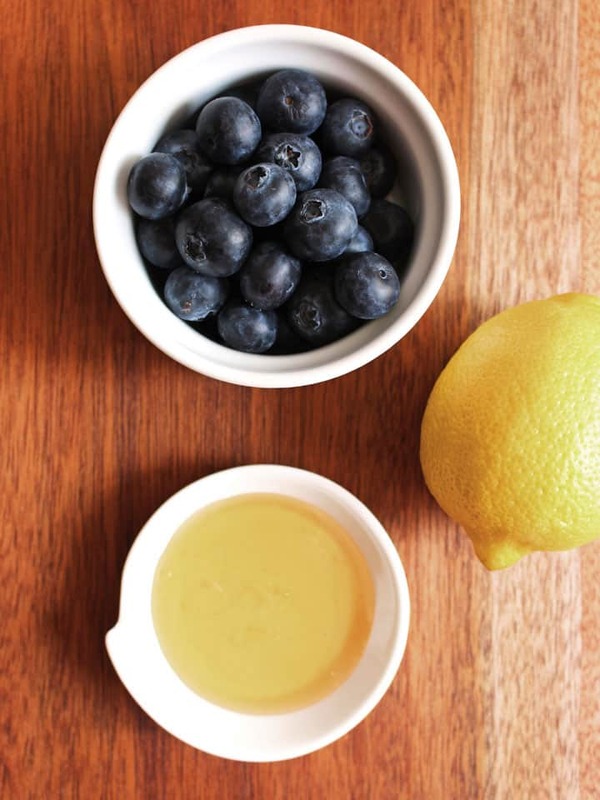 I love the fragnant lemon and juicy blueberry combo. And a scoop of vanilla ice cream… Heavenly!!! Must share! Does it have to be cooked in a cast iron pan ?